It's a recipe you've all been asking for and I finally got my act together to give it to you. BBQ quinoa pizza, my friends. Hope you're pumped! I'd guess for almost everyone, pizza is a comfort food. It's greasy, cheesy and even if you load it up with veggies, it's still pretty unhealthy. That's why I initially created this recipe. I wanted to give you a way to enjoy this fave food without feeling like you're “cheating”. 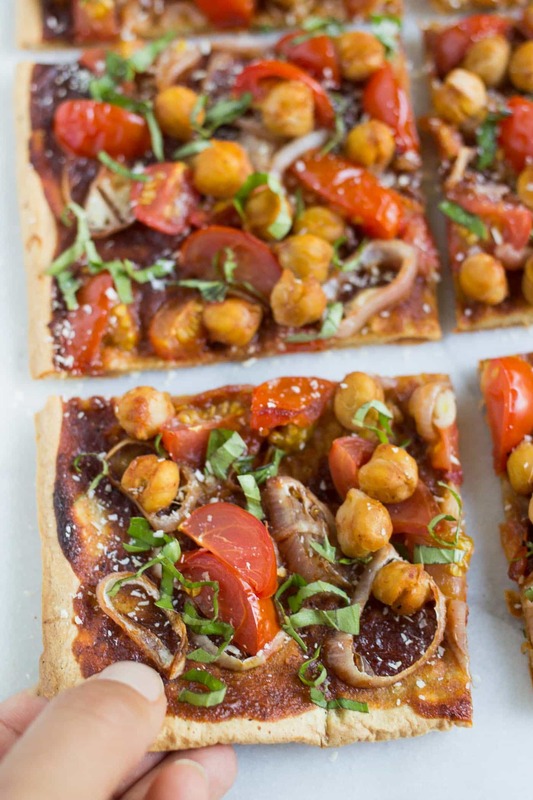 My quinoa pizza crust is crazy simple to make. You just need 5 ingredients and a blender. It looks kind of like a thick pancake batter that is pourable, but don't worry, it bakes up into a thin, crispy crust that can stand up to all sorts of your favorite toppings. My personal fave is usually pesto, but I have to say I'm leaning more and more towards this barbecue version; it's perfect for summer! 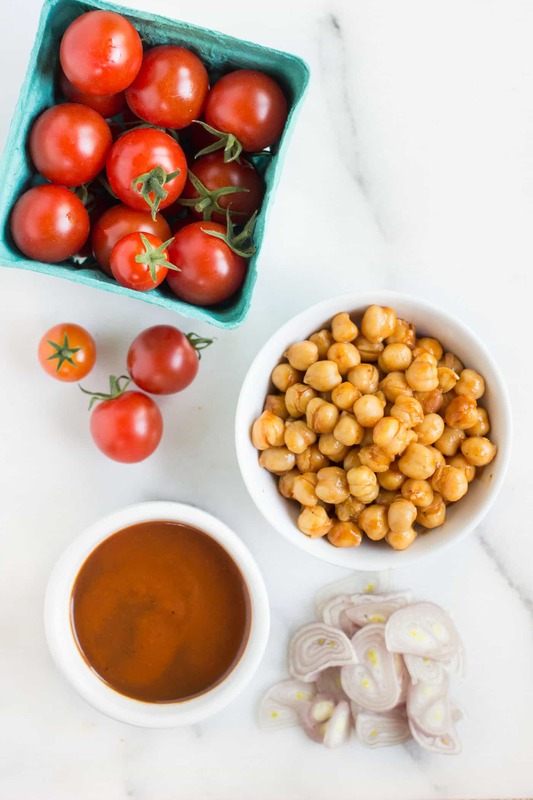 For toppings, I kept it pretty simple: an organic BBQ sauce as the base, then thinly sliced shallots, chopped cherry tomatoes and chickpeas. 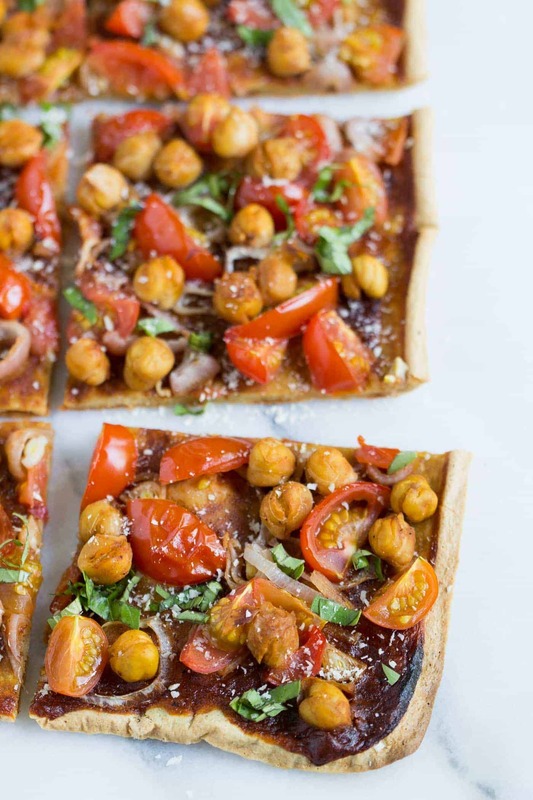 I chose to make this a vegetarian pizza, but you're a meat eater you could totally swap out the chickpeas for grilled chicken or shrimp. Both would be delicious and still make this pizza filling, yet light at the same time. This recipe doesn't make a huge pizza, where you have to worry about eating everything or wasting leftovers. It's the perfect size for two people, and is a dinner that Matt and I often split on the weekdays. It also makes great leftovers, so if you are cooking for one, you can make it for dinner and take the rest for lunch with you the next day! 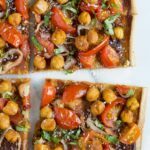 Either way, it's a great weeknight meal that doesn't take long to put together and it tastes like “real” freaking pizza! Now you can enjoy pizza whenever you damn well please without feeling an ounce of guilt! What's your favorite pizza topping? I'm thinking about sharing a few different flavor options in the coming months and I'd love to add your fave to the list! 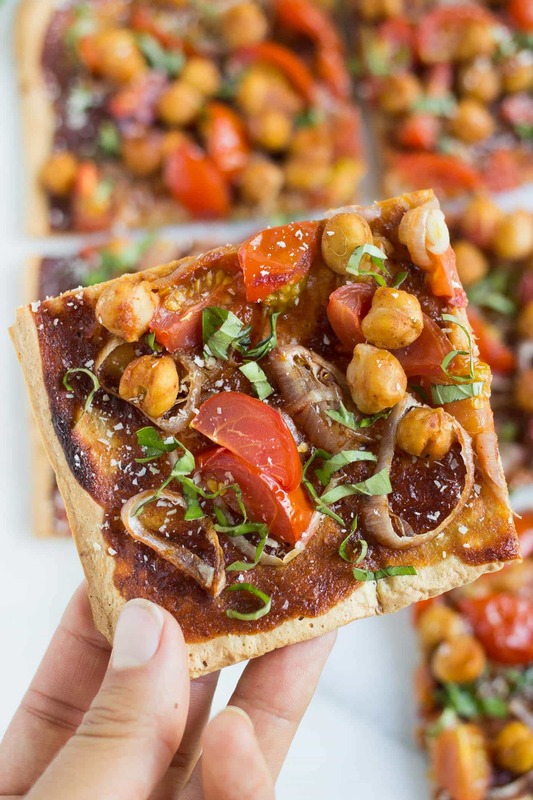 And if you end up trying this BBQ pizza recipe, or any pizza crust, I'd love to see a pic 🙂 Tag me @simplyquinoa and use #quinoapizza so I can give your photos some love! Prepare the pizza batter**, then pour it onto the baking sheet. Using a spatula, spread the batter into a large rectangle, about 12" x 6". Bake the crust for 10 minutes, then remove, flip and bake for another 5. 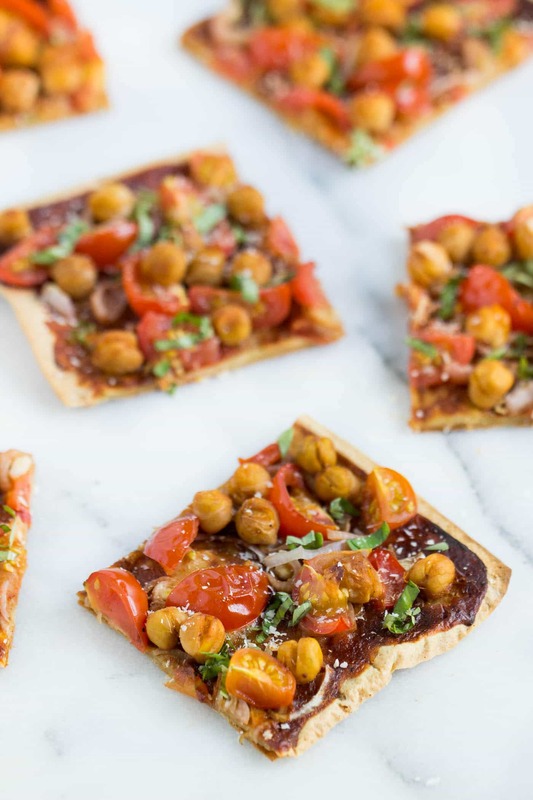 While the crust is baking, stir the chickpeas with 2 tablespoons of BBQ sauce. Remove and slice into squares. Top with nutritional yeast and basil if using. 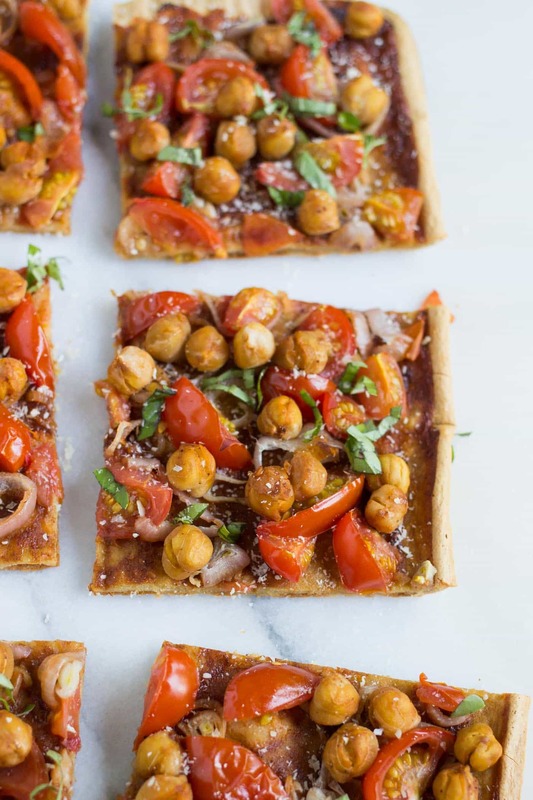 ** you need to soak the quinoa overnight (or for at least 6 hours) to make the pizza batter, so just do that in the morning before you head to work and you can make pizza when you get home! 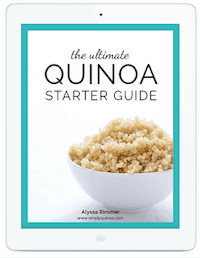 Watch how to make quinoa pizza! Saw your email today 3/31/18 about diet labels. Well said. My favorite pizza toppings are curly kale, roasted butternut and fresh mushrooms. Yum. Lovers your recipes. I’m going to try your pizza crust! Thank you!! And dang that pizza sounds amazing – I need to try it! Videos are a good supplement to a recipe to see how things are done however to evaluate the recipe and see if it’s right for me I need to see it in text first. Thank you.